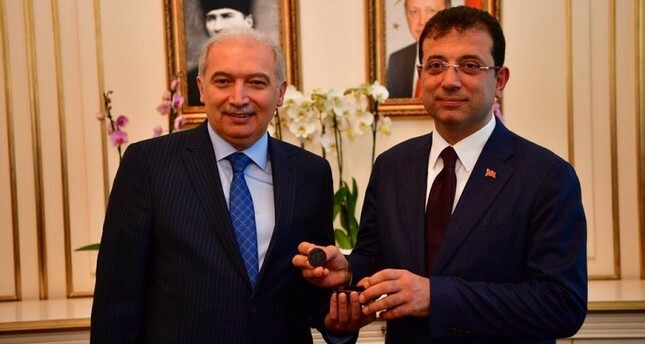 Ekrem İmamoğlu receives mayor's seal from Mevlüt Uysal in a formal ceremony after receiving his mandate for Istanbul mayor on April 17, 2019. He then arrived at the IBB headquarters in Fatih district for a handover ceremony. Addressing a large crowd receiving the mayor's seal from outgoing mayor Mevlüt Uysal, Imamoğlu said: "I will serve the whole of Istanbul, 16 million people from all walks of life and supporters of all political parties." The recounts over appeal processes before district and province election boards were concluded early Wednesday as the count in Maltepe district has been concluded. According to the final tally of the provincial election board, Imamoğlu carried the elections with 4,169,765 votes against People's Alliance candidate AK Party candidate Binali Yıldırım's 4,156,036 votes, with a gap of only 13,729 votes. The initial difference in votes announced by the YSK was 28,000 as of the morning of April 1, the day after elections. "Istanbul election board decided to give the mandate to Imamoğlu after due process. I hope this decision will be beneficial for us. Our party is still exercising its rights. The Supreme Electoral Board will have the last word," Yıldırım said Thursday. Although İmamoğlu received his mandate in accordance with the current results, since the objection process still continues, it does not conclude for certain that İmamoğlu has become the mayor of Istanbul as there are examples from both previous and current elections where the mandates were taken back. An example on the issue is the elections in central Kırıkkale province's Keskin district, where Good Party (İP) candidate Necati Alsancak won the elections by just seven votes over AK Party candidate Dede Yıldırım. After an appeal by the AK Party, the gap between the two candidates dropped to six votes in the recounting process. Due to the participation of restricted voters, the YSK decided for the renewal of elections and canceled the mandate given to Necati Alsancak before. In the Istanbul district of Maltepe, where there was a controversy over the election results, the recounting process of all votes, involving a total of 1,089 ballot boxes, was completed earlier on Wednesday. The merged vote count reports have been delivered to the Istanbul Courthouse in Çağlayan where the provincial election council is located. The reports in Maltepe revealed that Imamoğlu received 172,664 votes in the district, while Yıldırım got 121,082 votes. The recount in Maltepe did not end for 17 days due to incessant objections from the political parties. First, the election district boards had decided last Friday to increase the number of delegations responsible for the recounting of votes in the district from two to 12. However, the Nationalist Movement Party (MHP) and the AK Party objected to this decision, pointing out that they had not received written notification on the matter. Following an application from both parties, the first and second Maltepe district election board decided late Sunday, by a majority, to stop the recounting process with 12 delegations and re-initiate the process with only two delegations. In relation to the issue, CHP spokesperson Faik Öztrak told reporters Tuesday that the AK Party and MHP have been exerting enormous efforts to delay the counting process. He emphasized that a rerun will open deep wounds in the conscience of the public and urged the authorities to award the election certificate to CHP's mayor-elect Ekrem Imamoğlu. Late Monday, the YSK canceled the decision to stop the counting of all votes in Maltepe and ordered for the continuation of the process. While the recount was conducted by two delegations before, the election district boards decided to increase the number of delegations responsible for the recounting of votes in the district from two to six. Recounting of votes in the remaining 123 ballot boxes continued as of Tuesday morning and was finalized yesterday morning. Meanwhile, the YSK rejected yesterday an AK Party appeal against alleged irregularities in the merger of vote count records in Maltepe.